A (Very) Live Reading of A Christmas Carol (12th December) – The readers did a superb job of drawing the audience into the story, and taking us along with Scrooge on his journey of self-discovery and re-found love of life. And they did this using only their voices and a minimum of actions and props. Quite wonderful performance art! It was very well attended, with everyone there appreciating the dedication and passion of all of the actors, as well as Donna as writer/director and Michelle as production assistant. The Civic Centre does make a lovely venue, (although it could do with the stage lights being fixed!). 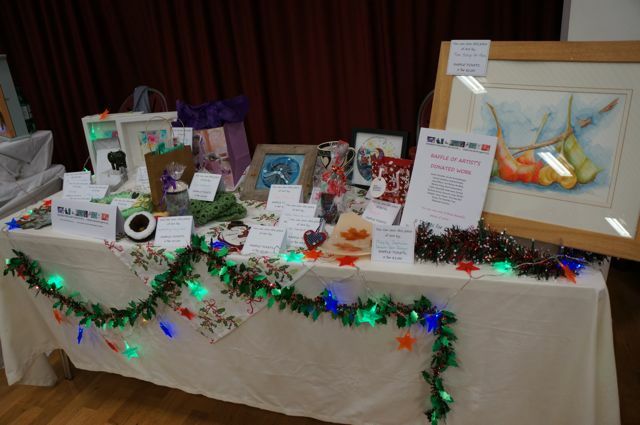 The Arts & Crafts Market (13th December) – Inverkeithing Arts Initiative would just like to express their deep appreciation of how much everyone took this event to heart. With such a collection of creative people showing their work, the event could hardly fail to attract praise, and with all of the visitors who came along, the Civic Centre had a wonderful buzz all day long. The singing by New Musical Theatre Alliance at 1.30 was a joy, and helped make the day feel like a real celebration of the season, and a real celebration of the creativity of all of the people who were gathered together in the hall. Mary, Michelle, Jane and Donna had a chance to speak to so many people about the aims and plans of Inverkeithing Arts Initiative. Thanks to everyone who wanted to know more, and caught our enthusiasm, and added their names to our fast-growing mailing list. Thanks also to the people who approached us with their ideas of how we can work together. That really is what IAI is all about! A special thank you to our volunteers, Margaret Robertson, Sue Walker Rosie Gibson and Sandy Stephen, who added so much to the day, and who are all creative and talented people in their own rights. Thanks to Andrew Quinn for his hard work and patience in helping us set everything up and take it back down again. Thanks also to our children, who helped put up and decorate the Christmas tree with such care and dedication!